If you have missing teeth, you may often avoid going to social activities. You may run for cover every time somebody pulls out a camera. You may only spend time with your nearest and dearest. You may be limiting your life. At Corry Dental, we would like to change all that. We offer a few systems that can give you your smile and your life back. These systems all rely on an amazing, revolutionary dental procedure called dental implants. A tooth implant is a metal rod that is placed into the gap in your smile where you have a missing tooth. The rod fuses with your jawbone. This fusing, called ossification, takes between 3-6 months. While you are healing for those 3-6 months, a temporary dental crown is placed on top of the tooth implant. When you are fully healed, a permanent dental crown is placed on top of the tooth implant. These dental implants are sturdy, durable, and will last your whole life. A tooth implant is very sturdy and durable. Dental implants topped with dental crowns look just like natural teeth, so you can smile and laugh all you want. A tooth implant functions like a regular tooth, so you can eat and chew as you normally would. Dental implants can support dentures if you are missing several teeth or all of your teeth. Dental implants provide a strong, effective support for dentures. 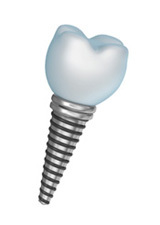 Dental implants can support a dental bridge if you have one or more teeth missing. A tooth implant or dental implants help your mouth look and feel full and complete again. If you have experienced a speech defect because of missing teeth, a tooth implant or dental implants can often eradicate this. Having a functional, beautiful, and natural looking smile is essential and truly can give you your life back. Don’t avoid social situations, don’t avoid having fun with neighbors and friends. Don’t run from your camera-happy nephew. Join life again with dental implants. Call us today!